Stalked Caulobacter crescentis cell giving rise to a flagellate swarmer cell. Photo from here. Commentors on a recent post here began arguing the side issue of bacterial immortality (derived from the question of whether the last universal common ancestor of all living organisms is extinct or whether it, in some way, is still with us today). Though the argument, as presented in the comments, was largely semantic, the central point was summed up by Don Cox in the statement: "When a cell divides (or multiplies) into two identical cells, you cannot say that one or other is an offshoot". This is a common textbook representation of binary fission as practiced by most bacteria and many eukaryotes*. As with many textbook representations, it is highly likely to be wrong. *Or most, depending (again) on your choice of semantics. After all, you yourself multiply by binary fission, at least at the internal level. Any cell, whether bacterial, eukaryote or what have you, is constantly bombarded throughout its life by inimical factors. Toxic substances build up, whether ingested from the outside world or produced as by-products of the cell's own metabolism. DNA and other vital cellular structures become damaged or otherwise functionally altered (for instance, by the process of DNA methylation). As this damage builds up, the cell 'ages' and, if the damage becomes too great, dies. One of the reasons cells multiply in the first place is to counter-act the build-up of these inimical factors. For instance, replication of a chromosome will produce a daughter chromosome in which the damage to the original has been repaired (I'm over-simplifying matters, of course, but you get the idea). To return to Don's statement above, the crux of the error lies in the belief that the "cell divides... into two identical cells" (emphasis added). But the two resulting cells of binary fission are not necessarily identical if the distribution of the original parent cell's accumulated inimical factors is not even. It may be possible that one cell receives the bulk of the problems while the other cell is left 'clean' (Nyström, 2007). Such uneven division has long been recognised in unicellular organisms such as bakers' yeast Saccharomyces cerevisiae that reproduce by budding, which after all is essentially fission in which the distribution of cytoplasm between the resulting cells is uneven. The budded 'daughter' cell contains little inimical factors when produced while the 'parent' cell retains the bulk. The first record of aging in a bacterium was also in a budding species, Caulobacter crescentis. In Caulobacter, a sessile stalked cell gives rise to a mobile swarmer cell (which will itself eventually develop into a stalked cell). However, each time the stalked cell produces a swarmer cell, it takes longer to produce the next one. It becomes old. Figure from Stewart et al. 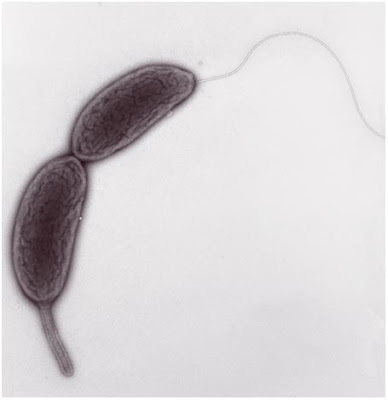 (2005) showing the fates of Escherichia coli cell ends over successive generations. Demonstration of similar aging in Escherichia coli, which produces superficially identical cells through fission, was achieved by Stewart et al. (2005). Rod-shaped E. coli cells multiply by elongating then dividing transversely across the middle so each daughter cell ends up with one of the original cell ends plus one newly produced end. But if we follow the cells to the next generation then one of their daughter cells will have an end that has persisted across at least two divisions while the other will have persisted for only one. One cell is therefore 'older' than the other and Stewart et al. discovered that 'older' cells took longer to grow and reach division than 'younger' cells. Based on the rate at which reproduction of older cells slowed down over successive generations, Stewart et al. calculated that a given cell end would persist for about 100 generations which also matches the rate of aging calculated for Caulobacter stalked cells. 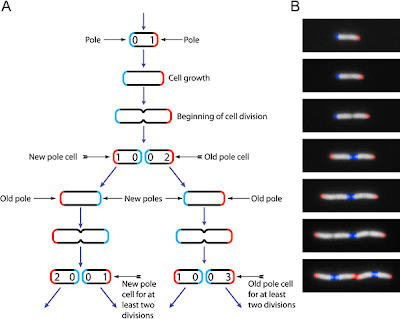 Similar aging has also been demonstrated in the fission yeast Schizosaccharomyces pombe, a eukaryote that multiplies by equal binary fission. As summarised by Nyström (2007), evolutionary modelling has indicated that asymmetric division of aging factors during multiplication may offer a selective advantage. Essentially, the chamces of one rejuvenated cell surviving and reproducing, even at the expense of producing one elderly cell, may outweigh those of two mediocre cells. Whether the aging process demonstrated by Stewart et al. (2005) leads to eventual cell death in nature remains unconfirmed but it does seem a very likely inference. Nyström, T. 2007. A bacterial kind of aging. PLoS Genetics 3 (12): e224. DOI: 10.1371/journal.pgen.0030224. That's fascinating -- I never knew that. Makes sense, though. In practice, are the "parent" cells still considered to be the same organism after fission? Or is that simply a question that isn't seen as worth bothering over? Meanwhile, Franklin M. Harold guesting at Small Things Considered, http://schaechter.asmblog.org/schaechter/2010/03/on-the-continuity-of-biological-membranes.html , considers membranes, and whether any membrane anywhere is ever made de novo. Is every membrane, in every organism, everywhere, really just an extended and re-extended fragment of the first ur-membrane, independently of whatever else has happened genetically? It does seem a somewhat semantic issue to me. Even the "parent" cell is going to include some new components. But then, organisms are metabolising and replacing old components with new all the time, even in the absence of reproduction. Is every membrane, in every organism, everywhere, really just an extended and re-extended fragment of the first ur-membrane, independently of whatever else has happened genetically? I'm not currently sure what I think of this. A cell's genetic composition can't directly affect its membrane, true, but it might affect the proteins involved in trafficking and assembling the membrane components. There have been some major changes in membranes over the course of evolution, most notably the replacement of acyl ester lipids with prenyl ether lipids in the ancestor of Archaea (unless, of course, it was the other way around). I shouldn't have said "independently", I should have said "in parallel with". Could there have been a period of mixed acyl ester and prenyl ether lipids at one time, with the mix gradually shading from one to the other? Or, if they are incompatible, maybe a mix of first one and then the other with a now-vanished intermediate? It's hard to imagine any process that would allow a flag-day switchover. If a mutation somehow changed the chemical affinity of the vesicle-trafficking enzymes, then I imagine a change in membrane composition could occur in not much more time than the cell's usual membrane renewal time. An important question, I suppose (and one to which I don't know the answer), is how self-organising the membrane is independent of enzymatic maintenance. The chemical nature of the membrane would hold it inherently stable to some degree, but would an unregulated membrane be likely to break up into more compact micelles? Thanks for the link to this interesting paper. I would like to see the experiment repeated with other types of bacteria. I find the interpretation of the results disputable. I think to suggest that the two results of a division, even if slightly asymmetrical, are "parent" and "offspring" is anthropomorphic, or metazoamorphic. However, the discussion is really about human perception rather than the observed events.